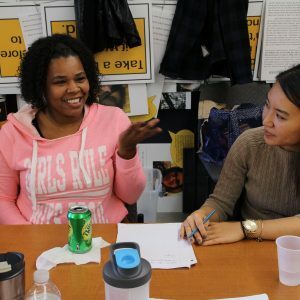 Graduate student Naly Tran (right) helps Markita Hall talk about cooking. March 1, 2017 — Matt Latiolais was in a Saint Rose classroom as usual for the Monday conversation group. As it often does, talk centered on food – family and shopping – and food. “How was your weekend?” Latiolais asked Markita Hall. Eight people in all went around the long table until each had asked and answered a question about the weekend. Each person there appeared determined to contribute, even if it took a little time. “I can do this. But it’s hard,” said Brenda Henderson. “Trust me, I know!” replied Hall. They are among 50 participants in weekly communication groups in the College’s Pauline K. Winkler Speech and Hearing Clinic. And while they don’t all have visible wounds, each has had an accident or suffered stroke or another illness that caused a brain injury that impaired communication. 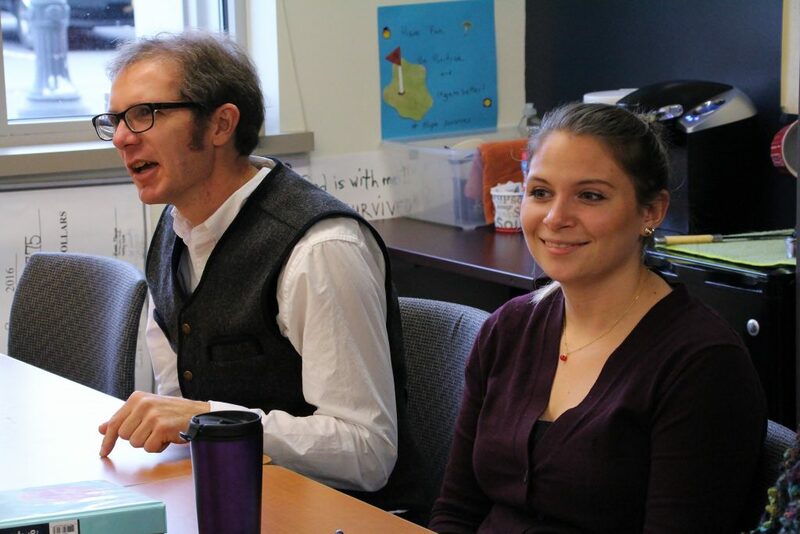 A collaboration between the Winkler Center and the College’s academic program in communication sciences and disorders (CSD), the two-hour groups allow people to tackle their challenges together. And the groups represent an emerging treatment. Traditionally, brain-injured individuals have worked individually with a speech pathologist. 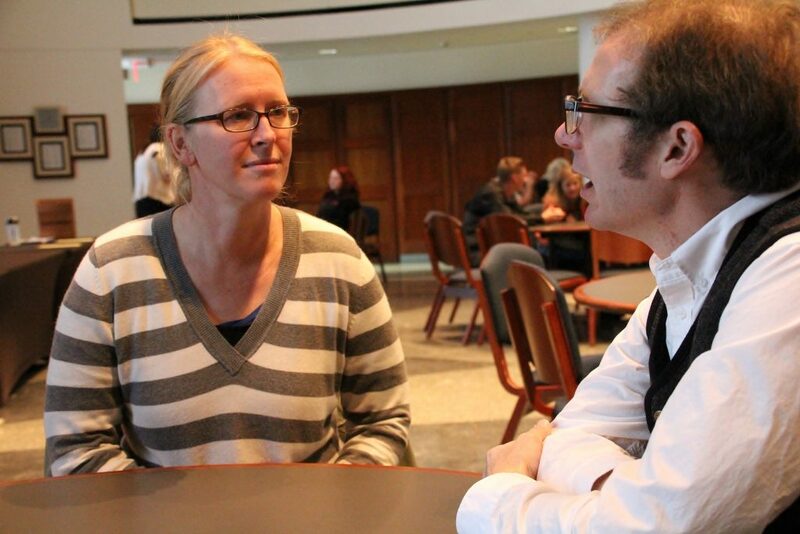 This helps them master words but not conversation, noted Julie Hart, director of brain injury services at Saint Rose. 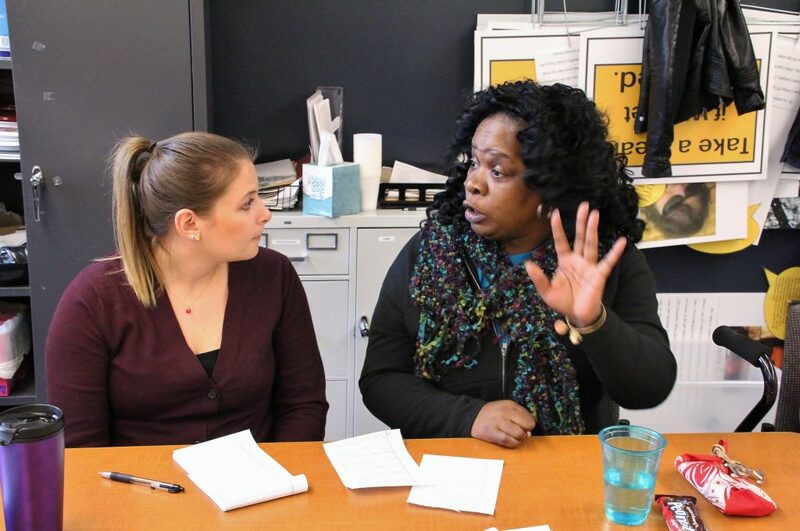 Graduate student Chelsea Hagerbaumer (left) helps Brenda Henderson regain her ability to converse. “I can do this. But it’s hard,” said Henderson. Twenty-two groups in all are devoted to navigating social media, discussing the news, books and, on Monday, just talking. A Thursday group visits the Gateway Diner. Other days participants eat lunch together on campus. This was the precisely the scenario that the late Saint Rose Professor Mark Ylvisaker pictured as he worked on campus and around the world on ground-breaking approaches to brain injury rehabilitation. A renowned speech and language pathologist, Ylvisaker, who died in 2009, fought to make treatment relevant and long lasting. He and other advocates developed a system that supports people in groups, in the community and at home. These services are available for as long as an individual needs them. “We absolutely continue to see improvements after a year, 10 years, even 20 years, because of the brain’s neuroplasticity.” said Hart, who served with Ylvisaker on the Saint Rose faculty. During groups, the mood is upbeat and involves a lot of joking – as when an attempt at the word “shrimp” sounded to some like “Trump.” But the work is excruciatingly difficult, Hart says. Most participants struggle with aphasia, a disruption in automatic language response. To guide him through this tedious process, Matt Latiolais carries a laminated cue card that reads “Slow Down, Gentle/Relax Throat, Deep Breath.” During a break, he said the thinking and speaking are exhausting. But in the four years he has taken part, Latiolais has gone from being unable to say more than a few words to speaking so he is largely understood. The ebullient Louisiana native met his wife in a college forestry program. They moved to Vermont with the dream of starting a Christmas tree farm. Their plan vanished the night Matt Latiolais shattered his skull during a fall at the lumber mill where he worked. Latiolais lost use of his right side. Through physical therapy at several hospitals, he has regained the ability to walk and some use of his shoulder and arm. After three years of individual speech therapy, his progress had stalled. Then he joined the Saint Rose group program. Today, Latiolais has recouped so much language that he plays a mentoring role in the groups. A natural conversationalist, he revels in asking questions and keeping discussions going. The groups that are restoring his communication and providing a community have also helped him imagine a career. This happened the day he brought in a small wood holder he had made to help him play cards with one hand. Hart suggested he launch a product line. Latiolais responded with Northend Woodworking, which sells adaptive cutting boards and book readers that Latiolais carves with one hand. Latiolais is eager to develop the business. But not yet.